Training includes Iowa Code governing Emergency Medical Services, types of agencies and classifications of responders, additional resources necessary for Critical Care Transport Services, and the importance of an EMS Contingency Plan. OMAHA, Neb. - Jan. 13, 2019 - PRLog -- Emergency Physician Matthew Bogard, Board Certified in Family Medicine and Board Eligible in Emergency Medicine, recently completed advanced training presented by the Iowa Bureau of Emergency and Trauma Services with an eye toward providing additional services to EMS agencies in rural locations. The course reviewed Iowa Code governing Emergency Medical Services, types of agencies and classifications of responders, additional resources necessary for Critical Care Transport Services, and the importance of an EMS Contingency Plan. Training was also provided regarding the Iowa EMS provider scope of practice. According to Dr. Bogard, "Emergency Medicine doctors interact with first responders, Emergency Medical Technicians, and Paramedics on a daily basis. We receive patients they have evaluated and cared for, often providing lifesaving treatments. In many cases rely on EMS services to not only transport patients to the Emergency Room but also transfer them elsewhere, sometimes over great distances. It is important to have a strong and supportive working relationship with the Emergency Medical Services departments in the areas you work." 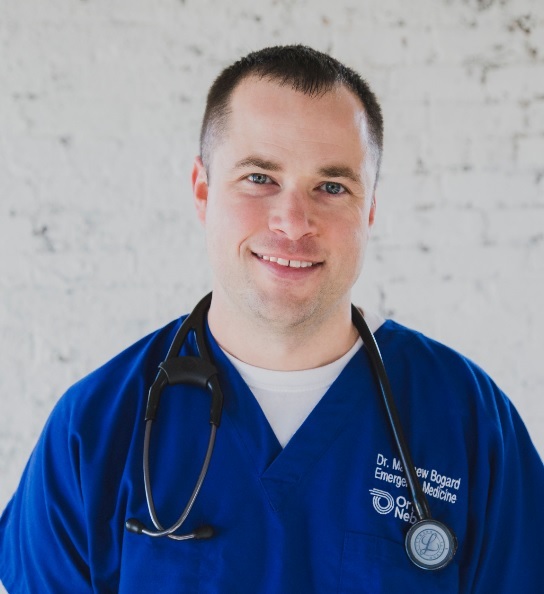 A native of Omaha, Nebraska, Dr. Matthew Bogard practices emergency medicine at multiple hospitals including Lucas County Health Center in Chariton, Iowa. Presently, he is Board Certified in Family Medicine by the National Board of Physicians and Surgeons and the American Academy of Family Physicians. Dr. Bogard is Board-Eligible in Emergency Medicine and is on pace track to be dual-boarded in the near future.